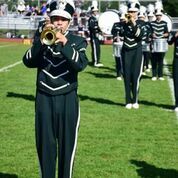 On Saturday, Sept. 29, the Harborfields Central School District held their homecoming parade and football game — culminating the weeklong celebration of Harborfields spirit and pride. 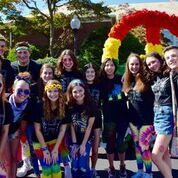 Following Friday night’s pep rally, where seniors Eric Werbitsky and Kate Driver were crowned king and queen, students put the finishing touches on their floats for the parade Saturday morning. This year’s theme was “Generations: HF Through the Years”, and just as in years past, students went above and beyond with their designs. In grade order, themes included the Prehistoric Age, Medieval Times, Wild West, and 60’s & 70’s. 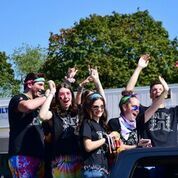 As the floats traveled from the Harborfields Public Library to the high school, students waved to the crowds of community members lining the sidewalks. 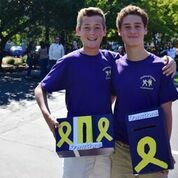 Many students walked alongside the floats as well, collecting donations to fund research for childhood cancer, which is near to the Harborfields community’s heart. 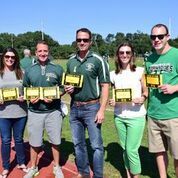 For homecoming week, HHS joined the Greenlawn Civic Association in their “Greenlawn Goes Gold” movement, which was developed and put into action by sophomore Natalie Pedrazzi. Along with collecting donations, cancer awareness gold ribbons were available for purchase, and all proceeds from the awareness week went to Maggie’s Mission. This local organization supports awareness and funds pediatric cancer research, and came into existence in honor of Maggie Schmidt, a Harborfields High School student who lost her battle with cancer in 2017. At the homecoming game, the spirit-filled crowd anxiously awaited the start of the game against Eastport South Manor. Some crowd members had large cutouts of players’ heads and shook them wildly and cheered when the team ran out onto the field. 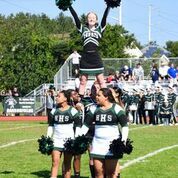 The Harborfields cheerleaders, marching band and kick line all worked together in pepping up the crowd, and there was no lack of spirit in the stands that day. 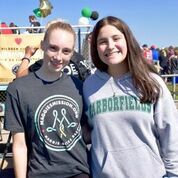 At the end of the first quarter, Harborfields held its first ever “Stand Up 2 Cancer” event, which was initiated by student Catherine Capodanno. 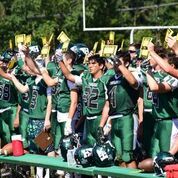 Throughout the week and the morning of the game, those in attendance were able to purchase signs to write the name of a loved one battling with cancer. When the moment came, community members all over the stadium stood up in support, holding their golden signs high in recognition of loved ones and their immense strength in the battle. 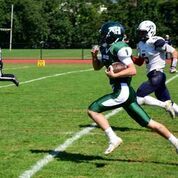 The Harborfields Tornadoes competed fiercely against ESM throughout the game, but unfortunately lost by three points, with the final score being 29-26.